On December 20, 2017, during the final hours of congressional action on the Tax Cuts and Jobs Act, the historic tax credit (HTC) was added back into the bill. 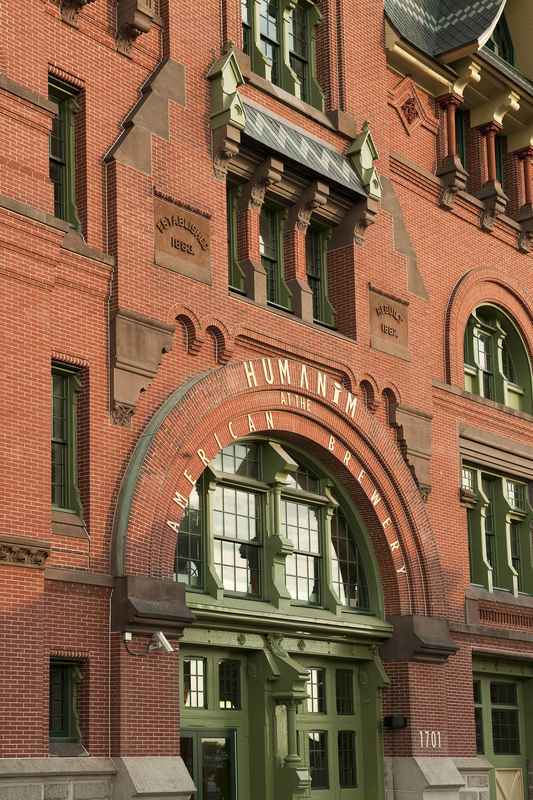 The HTC is the single most important incentive for the preservation of our nation’s historic buildings and has been instrumental in preserving more than 42,000 nationally significant resources. 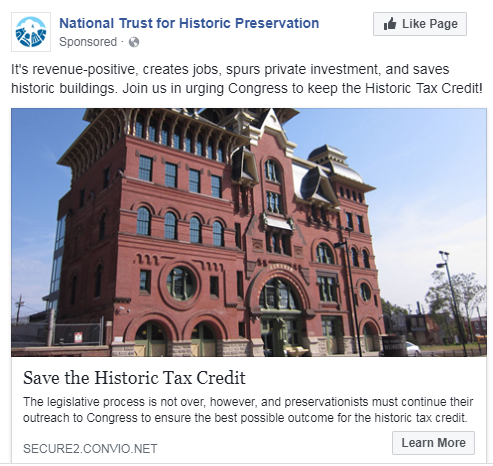 The National Trust for Historic Preservation, the National Trust Community Investment Corporation, and the Historic Tax Credit Coalition were able to catalyze strong political support for the HTC through our most significant political advocacy campaign in decades. By documenting our successes and lessons learned, we hope to assist future advocacy efforts at all levels of government. This three-part series covers launching the HTC campaign, building an advocacy network to connect with legislators, and messaging through media engagement and high-level resources. 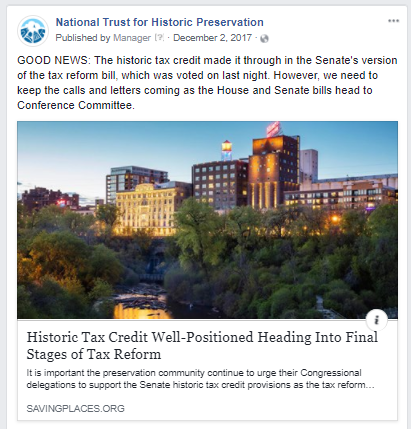 As the historic tax credit (HTC) campaign attracted attention on Capitol Hill, it generated significant interest from local and national media. Having established ourselves as the leading organization advocating for the HTC, the National Trust for Historic Preservation became a go-to source for reporters. We were able to generate a groundswell of news coverage and leverage the National Trust’s credibility on this issue through a combination of informed spokespeople, relevant case studies, and a deep well of HTC information. The campaign brought to the fore the impactful words of everyone from President Ronald Reagan to current members of Congress, from local community members and public officials to members of the press. This chorus of advocates helped drive media coverage and amplify support for the HTC, which became one of the credits most widely discussed on Capitol Hill during tax reform. 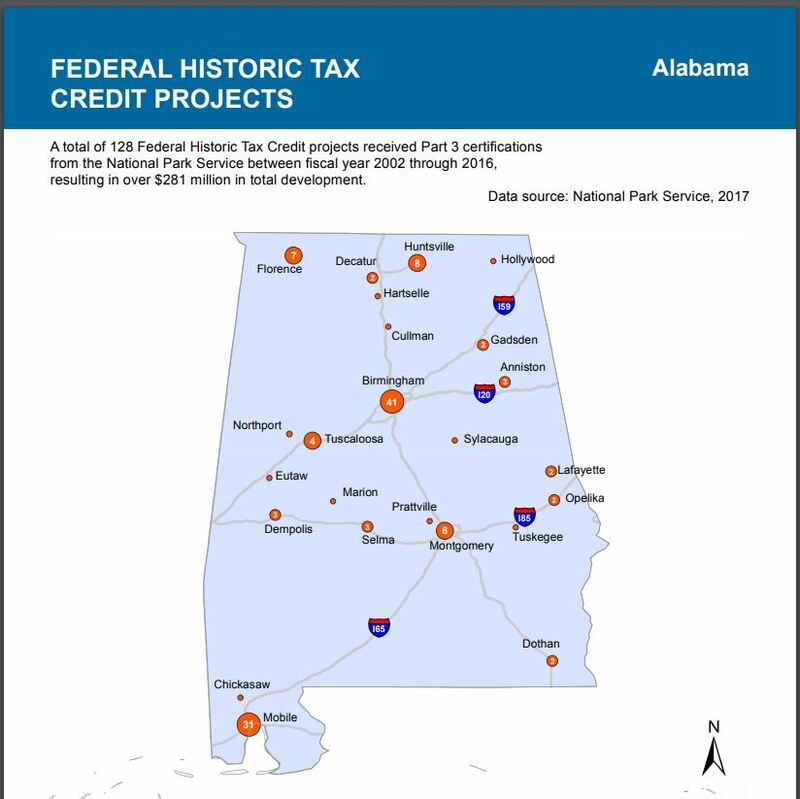 The National Trust provided specific data about HTC projects, including the jobs created, economic benefits secured, and historic significance preserved thanks to the HTC. Media training, including simulated interviews, helped our spokespeople remain polished when speaking with reporters. We made the most of reporter interactions by getting out our advocacy message—balancing consistency across interviews with fine-tuning that kept it up to date—and dealing with tough questions. To streamline our internal processes around digital communications—via our website, email, and social media platforms—we established a single point of contact to triage and prioritize online communications requests. Our public affairs team reached out to national reporters covering tax, real estate, economic development, and other related issues. Our media outreach also targeted reporters in key states and congressional districts that corresponded with federal advocacy priorities. Local news stories showcased the credit’s economic and social impact in small towns and large cities alike. We then used social media to amplify our outreach, sharing national and local news stories as well as our own coverage. Writing and placing letters to the editor also helped keep the HTC in the public conversation. Given the right resources and guidance, our local partners served as valuable allies in media outreach. To help preservation and Main Street organizations engage with local press and advocates, our campaign provided helpful tools—including a media toolkit with sample press communications, video and social media posts, and webinar presentations. The National Trust and the HTCC coordinated monthly webinars with industry stakeholders and state and local preservation leaders across the nation dialing in to receive real-time legislative updates. The webinars also provided opportunities for lobbyists and policy staff to answer questions from participants. Concurrently with the media relations campaign, the National Trust expanded our outreach online, including via email and on social media. 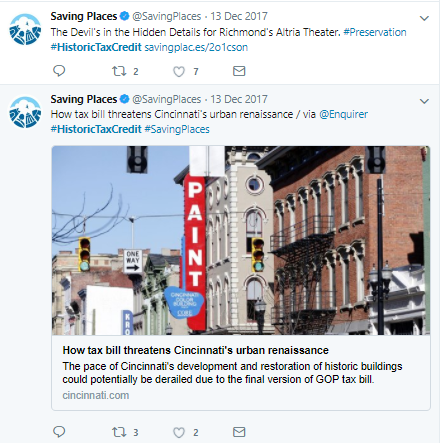 Our first step was to increase the volume of HTC-related stories on SavingPlaces.org, a National Trust site targeted to nonprofessional historic place enthusiasts. 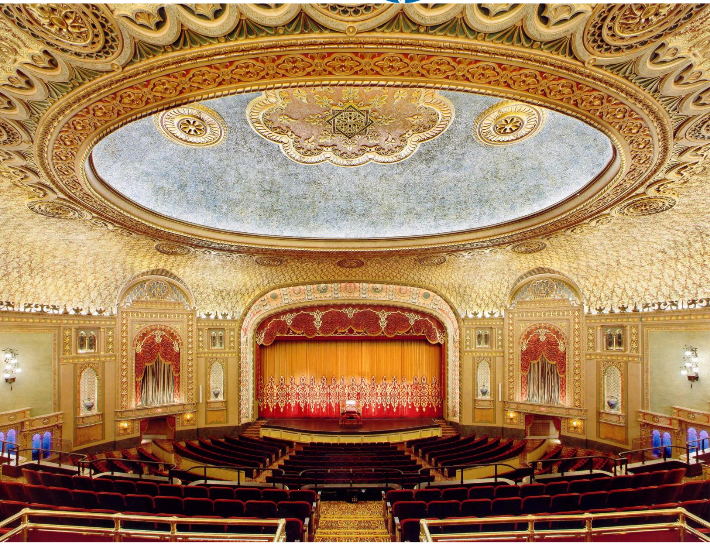 We featured several stories per month, highlighting places around the country that had been saved using the HTC. By posting HTC-related stories more frequently, we sought to introduce people outside the preservation field to the credit—ideally to make them feel connected to places that the incentive had saved so that we could call on them as grassroots advocates. These success stories, along with a series of action alerts—web forms that allowed grassroots advocates to email their members of Congress—formed the backbone of the digital marketing campaign to save the HTC. The stories and actions were shared broadly across the National Trust’s Facebook and Twitter accounts, and action alerts were also sent to advocates via email. As the campaign progressed, we added more online resources, including a video that combined archival footage of President Ronald Reagan speaking about the value of the HTC in 1984 with current information about the value of the credit. This proved an especially effective tool for reaching both our digital audience and Capitol Hill. Additionally, our action alerts grew in urgency as the final votes on the tax bill approached. To help spread our message beyond our existing fans and followers, we used Twitter, Facebook, and Instagram ads to reach new potential HTC advocates. We purchased both a series of broad, national ads targeted to audiences that might have an affinity for preservation and a second group of ads targeted specifically to the constituents of members of Congress whose votes we needed to sway. We updated the ads frequently to reflect our updated action alerts and to refine our targeting. While we began with a simple set of talking points, over the course of the campaign our materials evolved into a sophisticated catalog of supporting resources designed to provide new information to legislators. We dedicated significant time and resources to producing GIS-based maps (state | congressional district) that showed where HTC projects were located, when they were completed, how large they were, and what the new uses of the repurposed resources would be. The maps, which paired National Park Service data about individual HTC projects with a model developed by Rutgers University to quantify the economic impacts of rehabilitation, succinctly conveyed the relevance and economic impact of the HTC in a particular state, city, or congressional district. In addition to sharing these high-level resources with leaders on Capitol Hill, we made them available on the Preservation Leadership Forum website, allowing preservationists and allies in the field to use and distribute the data and present a united front. Screenshot of one of the maps built to share information about the HTC campaign. Links to the full array of maps are above. To cultivate key supporters, we also published in-depth HTC reports demonstrating the credit’s use and success in politically important states like Montana, Ohio, Texas, and Wisconsin. These reports included series of case studies that highlighted the financing of different types of rehabilitation projects, which helped convey the importance of HTCs in these real estate transactions. And, while the impacts of the HTC are intuitively easy to understand when they are explained, we only had the data to truly show the credit’s catalytic impacts once economist Donovan Rypkema released his report examining six neighborhoods in three target states. Congressional staff were consistently impressed by the number of new business licenses and building permits issued as well as the higher property values in neighborhoods where HTC rehabilitations had occurred. Local, state, and national sign-on letters also helped the campaign demonstrate significant support for HTC. For example, groups of mayors throughout Alabama, North Carolina, Michigan, and Wisconsin amplified their support by joining together to send a letter to their congressional respective delegations. Similarly, 33 Main Streets in Iowa sent a letter to their delegation emphasizing the importance of the HTC to their economic development plans. The National Trust and the campaign staff at the National Trust Community Investment Corporation provided letter templates for these and a number of similar efforts. We knew that to affect major federal legislation, we would need to mount a major campaign. In September, we submitted a national letter signed by 1,500 businesses and organization representing all 50 states to the chairs and ranking members of the House and Senate tax writing committees. This was the largest expression of support for a national preservation policy issue ever conveyed to Congress. Over the course of the HTC campaign, our efforts resulted in more than 40,000 letters sent to Congress. Our video featuring President Reagan received nearly 500,000 views. Only by mounting a campaign on a national scale were we able to affect national change and save the HTC. But much of what we learned is not specific to congressional advocacy. The strategies we now know to be effective can be replicated and scaled to the state and local levels to support the efforts of smaller organizations fighting to save that places that are significant to their community and build a robust network of preservation legislation across the country. Renee Kuhlman is the director of policy outreach, Shaw Sprague is the senior director of government relations, Andy Grabel is the associate director of public affairs, and Sarah Heffern is the director of social media at the National Trust for Historic Preservation. Michael Phillips is the public policy manager at the National Trust Community Investment Corporation. Read the other posts in this three-part series examing launching the HTC campaign, and building an advocacy network to connect with legislators.